There are currently three technical routes. First, space vector pulse width modulation (SVPWM) is used to reduce the loss. Secondly, silicon carbide materials are used to reduce the internal resistance of power devices. Third, three-level, five-level multi-level electrical topology and soft switching technology are adopted to reduce the voltage at both ends of power devices and the switching frequency of power devices. SVPWM is a fully digital control method, which has the advantages of high utilization rate of DC voltage and easy control. It is widely used in inverters. With high utilization of DC voltage, lower DC bus voltage can be used under the same output voltage, which reduces the voltage stress of power switching devices, reduces the switching losses on devices, and improves the conversion efficiency of inverters to a certain extent. In space vector synthesis, there are many combinations of vector sequences. Through different combinations and sorting, the effect of reducing switching times of power devices can be achieved, which can further reduce the switching losses of power devices of solar inverters. The impedance per unit area of silicon carbide devices is only one percent of that of silicon devices. IGBT (insulated gate bipolar transistor) and other power devices made of silicon carbide can reduce the on-state impedance to one tenth of the conventional silicon devices. The silicon carbide technology can effectively reduce the reverse recovery current of the diode, thus reducing the switching loss on the power devices and the current capacity required for the main switch. Therefore, using silicon carbide diode as the reverse diode of the main switch is the way to improve the efficiency of the inverter. Compared with traditional fast recovery silicon reverse parallel diodes, the reverse recovery current of silicon carbide reverse parallel diodes decreases significantly, and the total conversion efficiency can be improved by 1%. After using fast IGBT, the switching speed is accelerated and the conversion efficiency of the whole machine can be improved by 2%. The efficiency of the inverter will be further improved when the SiC reverse-parallel diode is combined with the fast IGBT. Soft switching technology makes use of resonance principle to make the current or voltage in switching devices change according to sinusoidal or quasi-sinusoidal law, and turn off the devices when the current crosses zero naturally. When the voltage naturally crosses zero, turn on the device. Thus the switching loss is reduced, and the problems of inductive switching and capacitive switching are greatly solved. When the voltage at both ends of the switch or the current flowing through the switch is zero, the switch is turned on or off, so there is no switching loss in the switch. 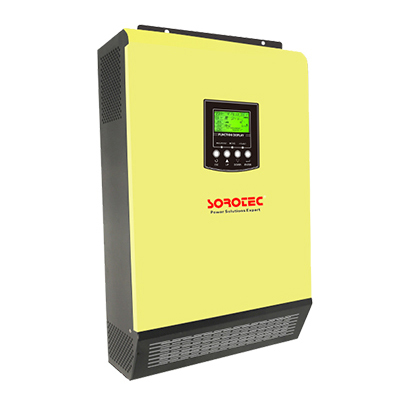 Three-level inverters are mainly used in high voltage and high power applications. Compared with the traditional two-level structure, the output of three-level inverters increases zero level, and the voltage stress of power devices decreases by half. Because of this advantage, under the same switching frequency, three-level inverters can adopt smaller output filter inductance than two-level inverters, and the inductance loss, cost and volume can be effectively reduced. Under the same output harmonic content, three-level inverters can adopt lower switching frequency, lower switching loss and higher conversion efficiency than two-level inverters.